One of the big struggles of being a first generation Canadian is holding onto the traditions of our culture while embracing the modern world. While I feel really blessed that I was raised by a very traditional mom that taught me a lot about holidays and festivals, not everyone had that. I have many friends that struggle to celebrate cultural and religious holidays because they don’t know how. 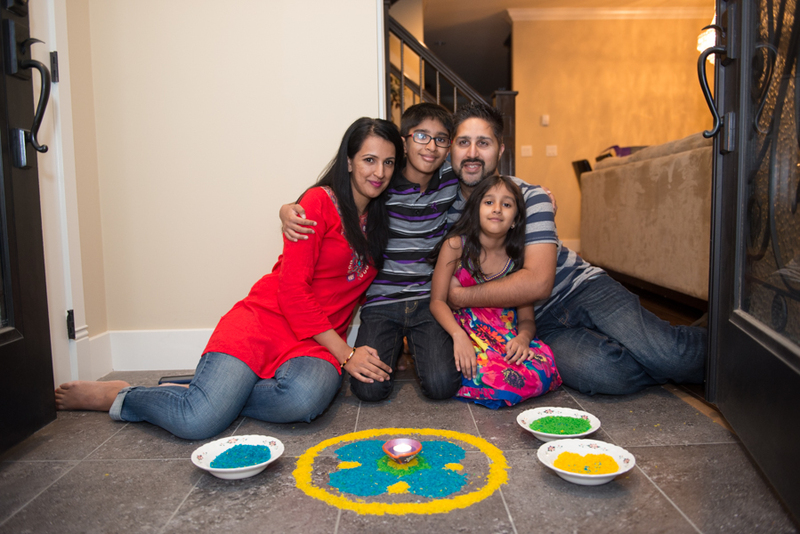 Today I’m going to share a few of my family’s Diwali traditions that might be easy enough to incorporate into your holiday routine. Remember; it’s not about doing the ‘right thing’, it’s about recognizing that Diwali is a significant cultural holiday and celebrating it with your family. Cleaning for Diwali is a big deal in India. Many people believe that the Laxshmiji (the Goddess of Wealth) won’t visit your home on Diwali if the home isn’t clean. You might not believe that, but it is a lovely feeling to get rid of things you don’t need and clean your house before the madness of Halloween and Christmas takeover, so I’ve adopted this tradition. Last weekend we purged, this weekend we will clean. I’m a huge believer that a clean and welcoming threshold affects how you feel when you come back home, and the energy in your home so I focus on this area all year round. However, for Diwali we do try to dress up the door a little more than usual. Last year we did henna inspired and glitter pumpkins, and this this year we are working on a special glitter rangoli. 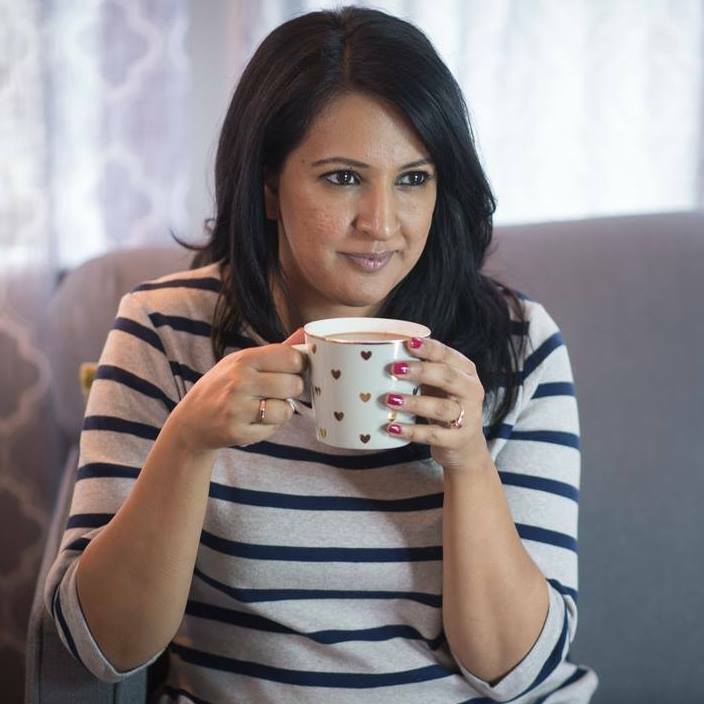 When I was a kid we never celebrated Choti Diwali, which happens the day before Diwali, but I use it as an opportunity to share the Diwali story with my kids, (sort of like reading Twas the Night Before Christmas on Christmas Eve). 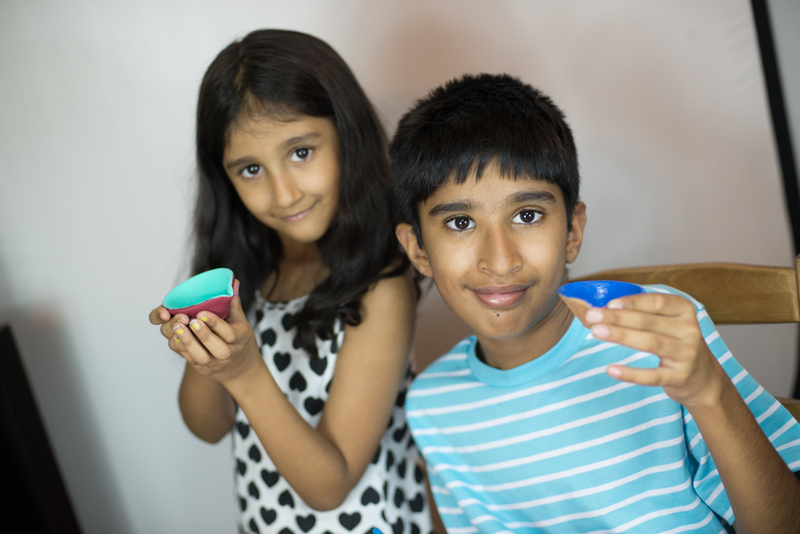 After dinner I like to ask the kids to share what they remember about why we celebrate Diwali and then fill in the holes with any missing details. We also light our first diya before going to bed on Choti Diwali to get excited about Diwali celebrations the next day. 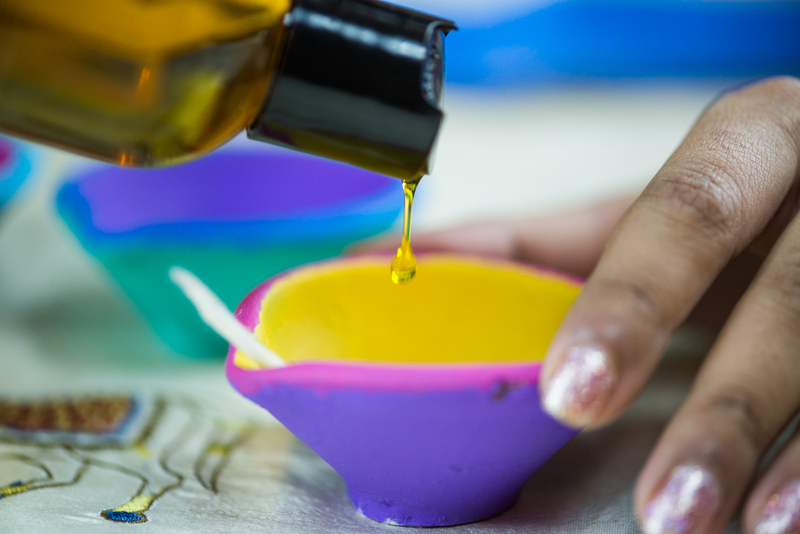 The first diya is always filled with mustard oil and then we use a lot of tea lights. At our house we do Diwali cupcakes and share them with the students and staff at the kids school. For the last three years I’ve made about 200 cupcakes every Diwali. Crazy right? Next week I’ll share this year’s recipe. You could also do cookies or a cake – whatever your family likes. I always try to instill the concept of ‘Athithi Devo Bhava’/The Guest is God in my kids, so Diwali dinner without a guest just doesn’t make sense. We often invite family friends, but sometimes we also try to invite a friend that might be alone on Diwali, to welcome them into our family. In fact, since my friend Dale is in Spain this year, the kids have already started asking who will come over for Diwali this year! This might not be a fit for your family, but I like to clean out the Mandir, decorate the space, and add a new ‘murthi’ (religious figurine) each year. I also find that the kids ask a lot of questions around religion and Diwali when we do this together. If you don’t keep religious symbols at home you could visit the Gurudwara or Mandir. Or if you don’t want to do something religious, volunteer at the Food Bank together. Whatever you do; do it as a family. Alternatively, you can also decorate your house like you would for Christmas. Maybe set up the mantle with some special pieces, or hang lights? 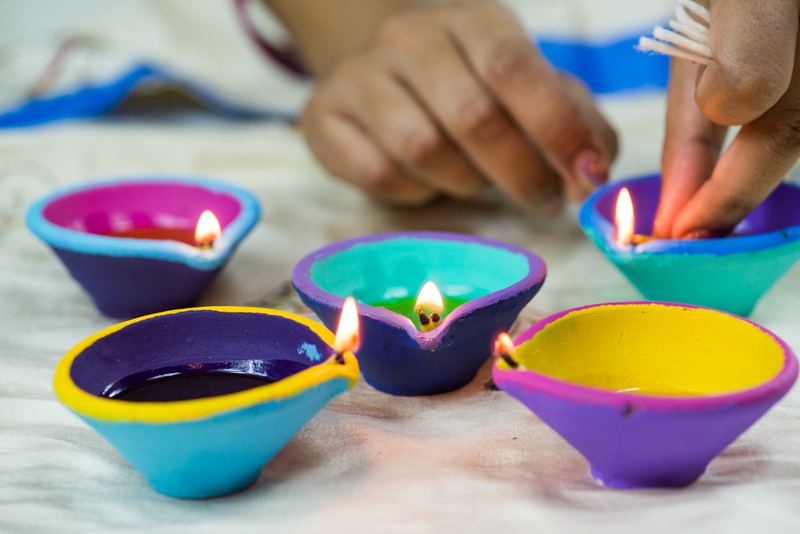 Since Diwali is the festival of lights, you can’t celebrate without diyas, tea lights, and sparklers. I tend to go a little over board and fill every surface in the house with candles and diyas, but you can just do five if you like. I’m not sure why five, but that’s what my mom taught me was the minimum number of lights you should light up. One other tradition I love but might not be for everyone is keeping one diya lit up all night long on Diwali. I try to stay up as late as I can to nurse one diya along and keep refilling it with mustard oil. There is something about that one diya lighting up the night and making way for a prosperous year ahead that fills me with joy. 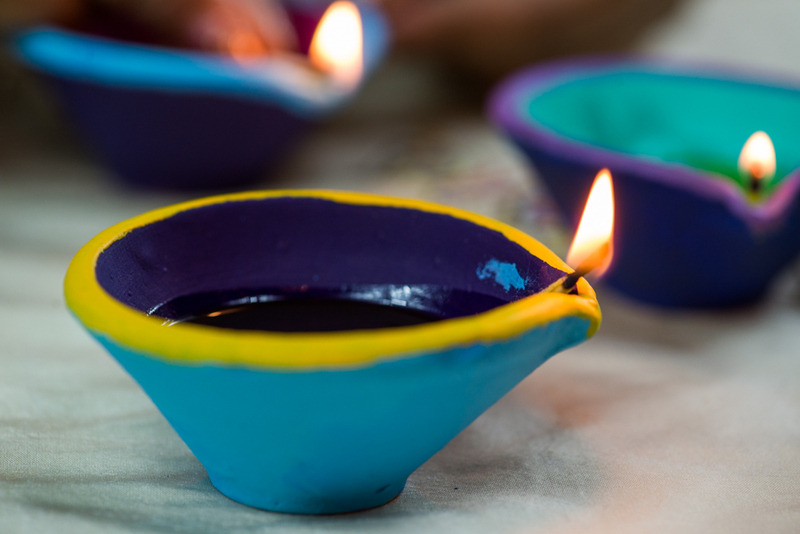 What are some of your Diwali traditions, I’d love to hear about them! What a great post! I love all these traditions because the common thread is sharing things with your family. And staying up with just a diya and the night for company is just beautiful. Thanks for sharing. Love the photography! Thank you Taslim! I’ve been so blessed to work with such an amazing photographer lately, it’s such a treat to just create projects & recipes and have someone taking care of the rest.